Yes, everything is ahead of schedule. 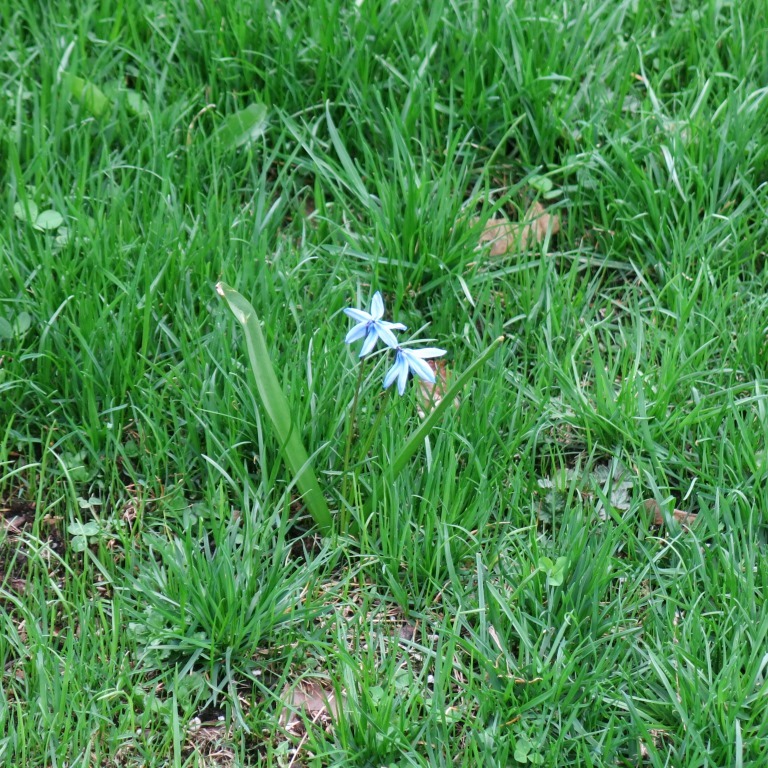 One simply has to embrace what is – it is spring after all! I’m loving the early bulbs. This is their (albeit brief ) time to shine. 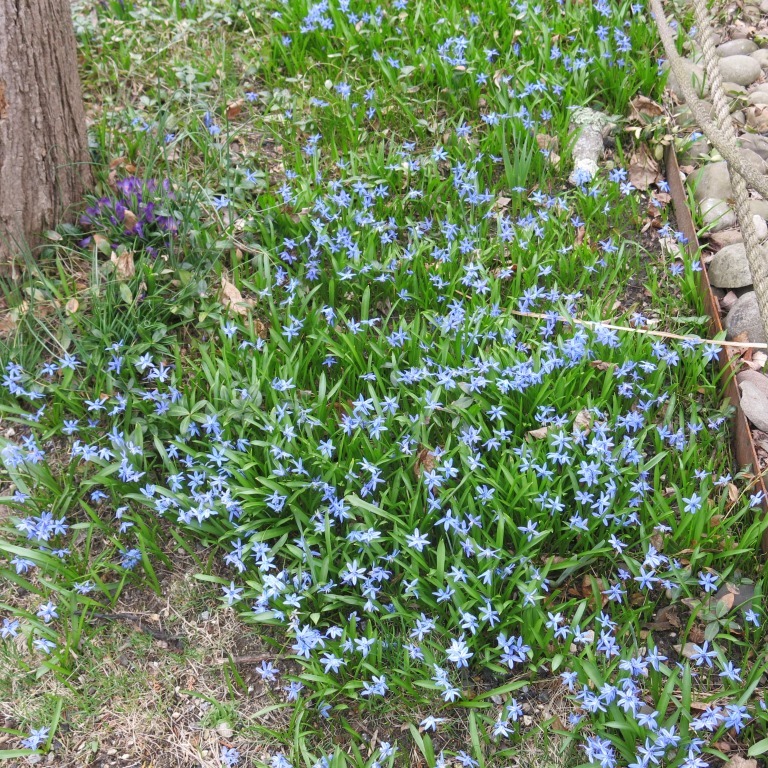 The mix of periwinkle-blue scillas and mauve creeping-myrtle carpeting the top of the front garden is the sweet sight that greets me when I return home from anywhere. 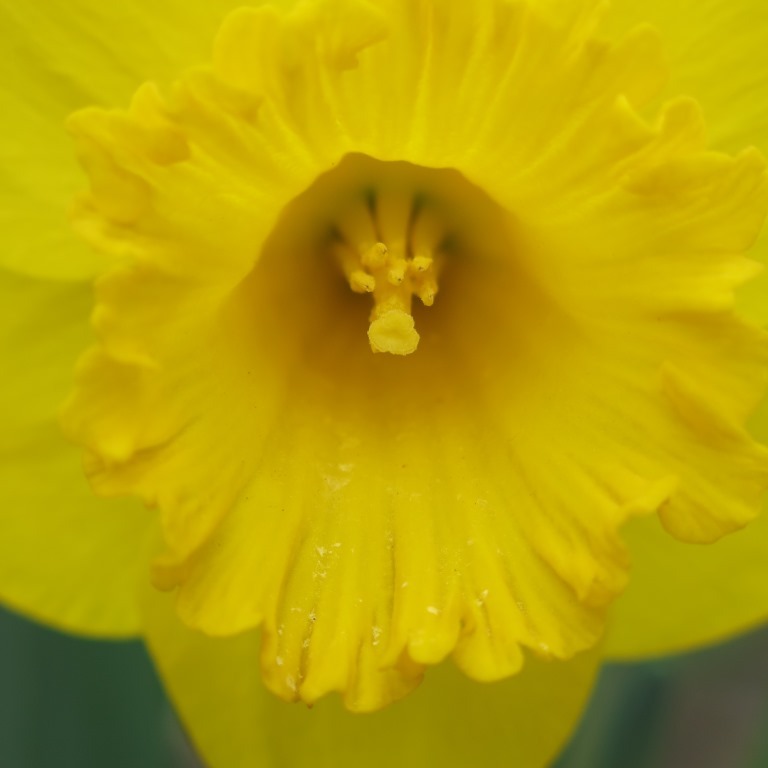 The yellow of the daffodils in their midst give an extra pop of delight. 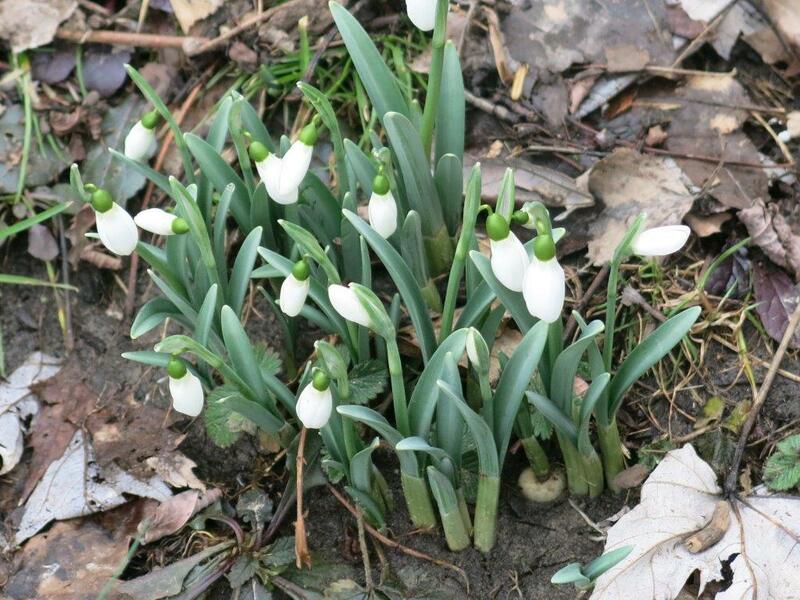 In the meadow, as the earth is greening up, the small bulbs sit like scattered gems twinkling in the clear sunshine. Every day reveals more treasures. Makes getting on with the daily chores so much more exciting. It’s hard to be grumpy when surrounded by beautiful new beginnings. At the same time, I find it totally distracting! Last week, while I was tackling the numerous hydrangea surrounding the meadow, I kept pausing to admire the new growth at their base. It looked like there was a larger amount of dead wood to cut off and as a result, the shrubs seemed to be shrinking in size. At first, I was quite alarmed. 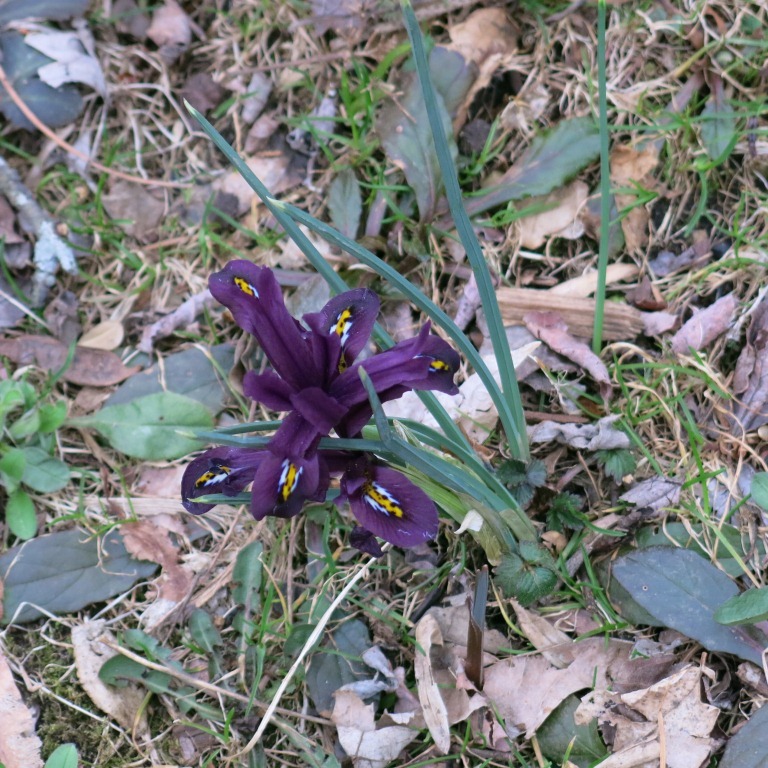 It had been a rather mild winter so I didn’t expect much loss. 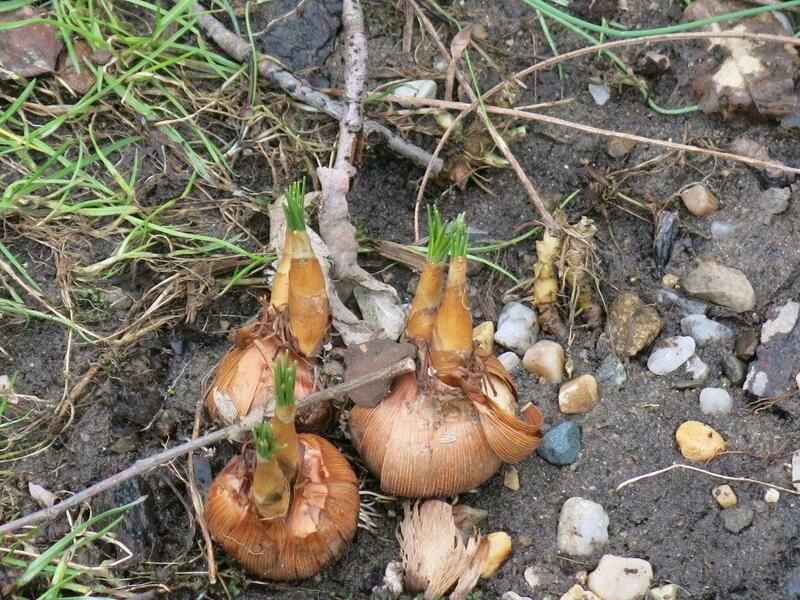 Spying the basal shoots emerging shyly was a relief. 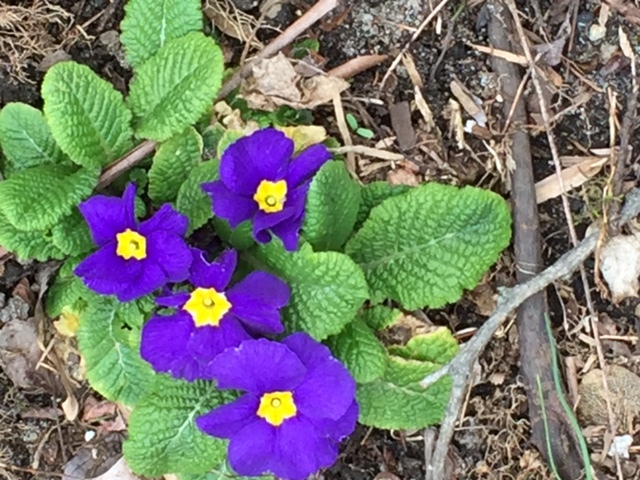 And then my eyes came to rest upon the primroses and hyacinths nosing through the soil. So charming and reassuring. Not far from where I was working, I noticed black-capped chickadees investigating an opening on the trunk of the sugar maple where a branch used to be. Perhaps they will be moving in soon. 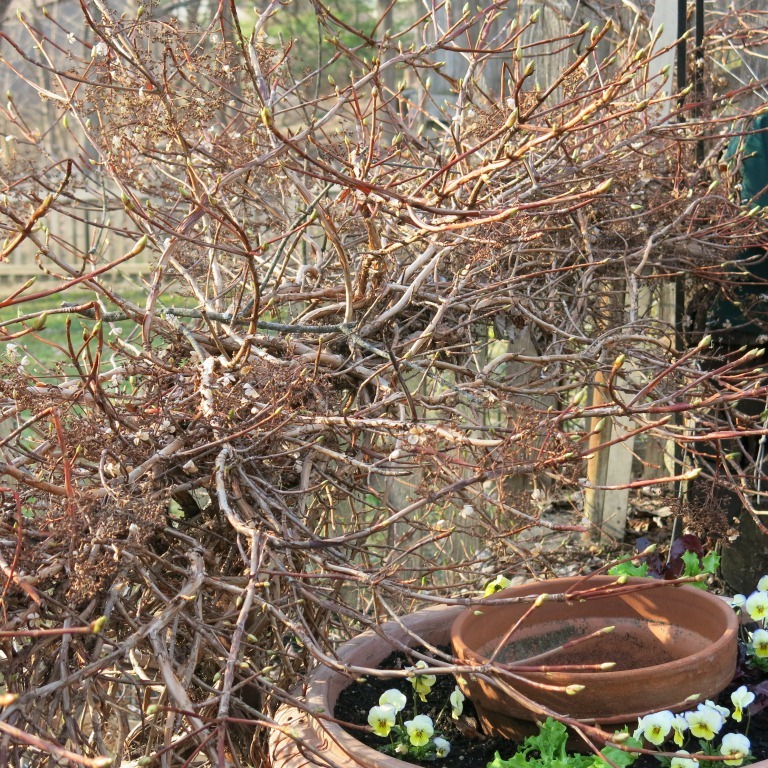 Using the lengths of grapevine prunings to wrap around the railing at the end of the driveway, I was struck by the way the buds sat on the climbing hydrangea that also grows around this structure. The plumules make the vine look like a network of stringed lights as though waiting to illuminate the garden. 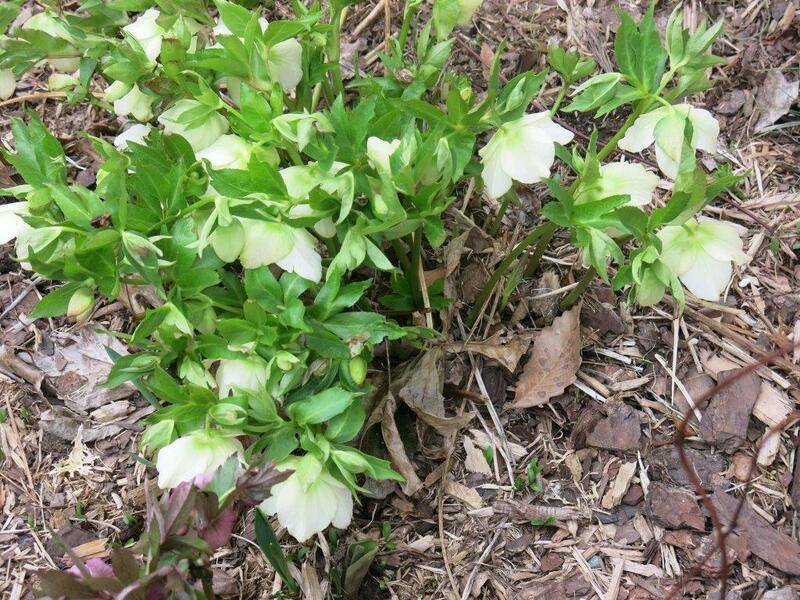 Which of course they shall when their creamy lace-cap flowers bloom. Meanwhile, assorted birds seemed to think I was giving away nesting material – they demonstrated great expertise at swooping in, picking up a short bit of grapevine and taking off to sites unseen. Cool weather vegetable plugs await planting. But first I must clear the plot of anything that could harbor slugs and turn over the green cover of unidentifiable seedlings that have spontaneously sprouted. I think that this year I will spread a nice layer of sharp grit over the soil to deter the aforesaid pest. However, before I do all that, I must stop to run my hand over the creeping thyme that has self-seeded near by. The fragrance evokes menus for herb infused meals under the new pergola. Soon, very soon…. In the greenhouse, several plants can be brought outside but the kumquats hanging like tiny suns catch my attention. Now I’m off to make kumquat chutney. A dollop of it goes divinely with a sliver of cheese atop a cracker. Add a glass of perfectly chilled white wine and you have a feast. As a result of the joyous diversions, every task takes longer than they ought. The going is slow but the spirit is high. As Mother Nature colors in the garden, the anticipation is palpable. An awful lot of chores need to be done and time always seems short. Yet, I know I cannot let myself miss these days of rebirth. After all, they hold all of a gardener’s hopes and dreams. 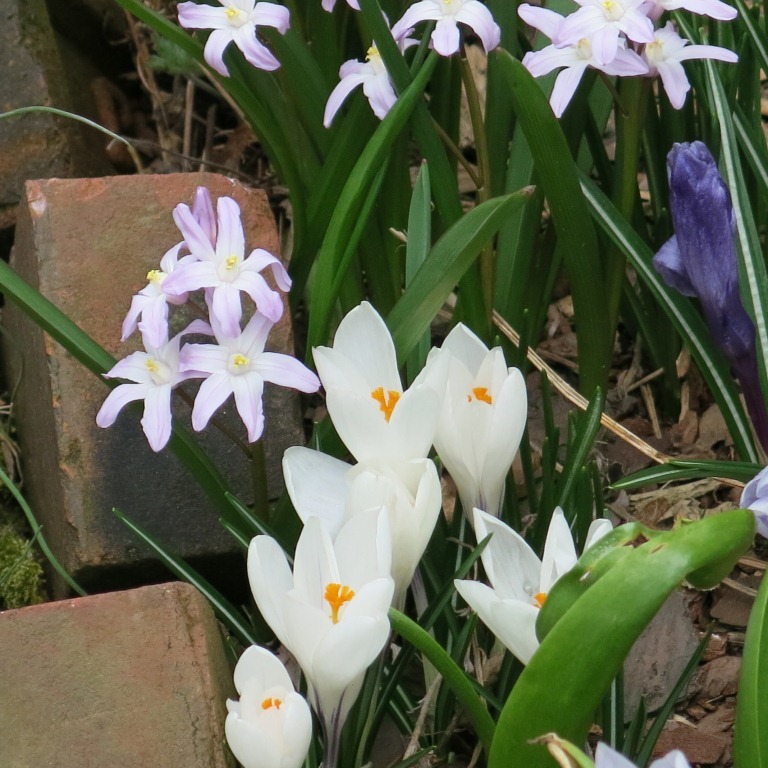 Is my garden’s Open Day marked on your calendar? It is May 7, 2016. 10:00 am to 4:00 pm. Spring arrived bearing snow this year. While I listened to forecasts that couldn’t pinpoint just how much snow to expect, I found myself crossing my fingers and fervently sending out messages to the universe to please, please spare us any real damage. Methinks I was heard. 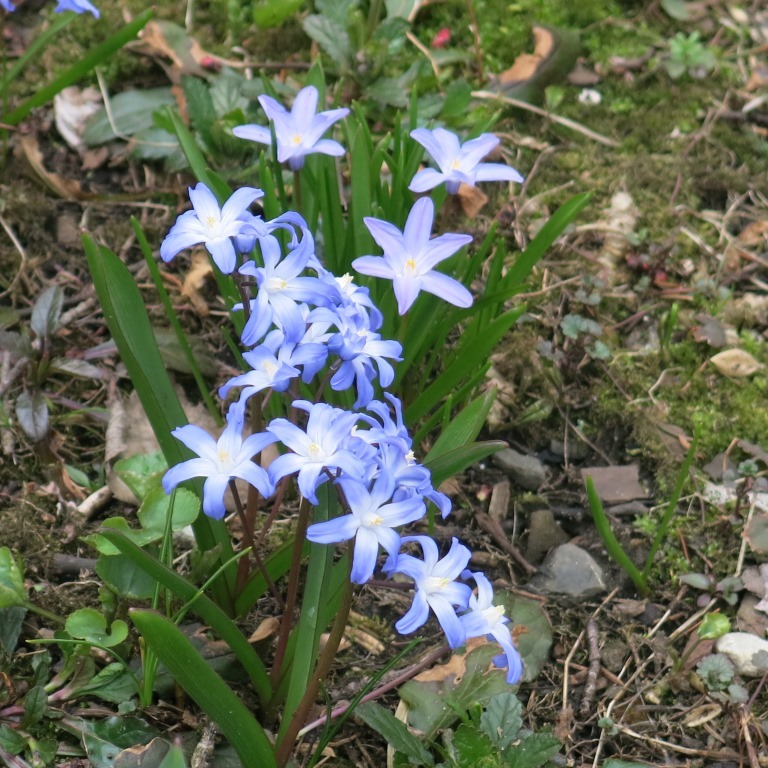 The crocuses, hellebores, snowdrops and scillas had been blooming for a week or so already but, the daffodils had just begun to unfold their sunny petals and I was concerned that they would be crushed. Thankfully, the flowers were spared. For a brief period the snow made everything white and pretty but in no time at all it had all melted away. Spring was once again underway. But it got me thinking about how we approach life. So much time is spent in anticipating and planning that we don’t pause long enough to simply be. 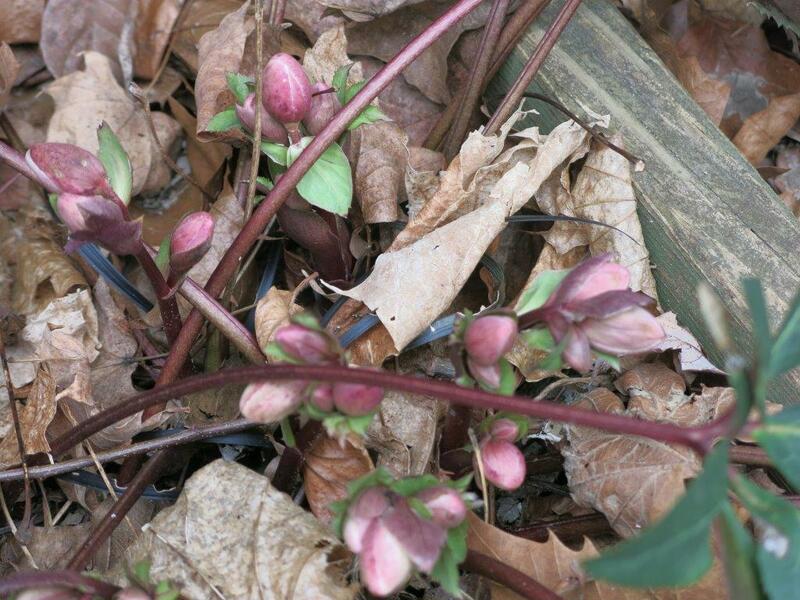 All winter long we look forward to the return of life in the garden. 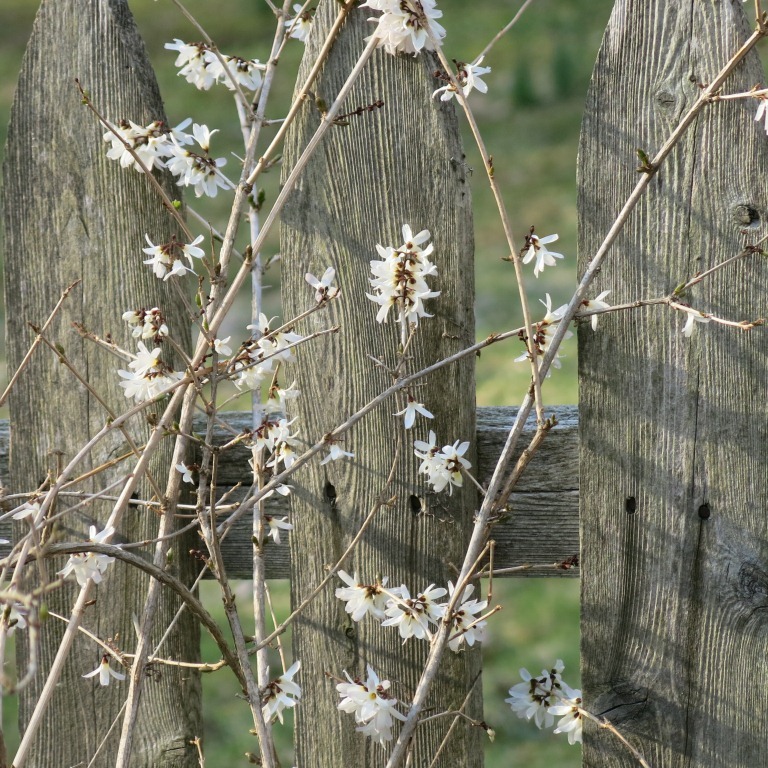 And then, when it starts to bloom, we get caught up in the chores and to-dos to get ready for summer. There ought to be a time we allow ourselves to be completely present in the garden. 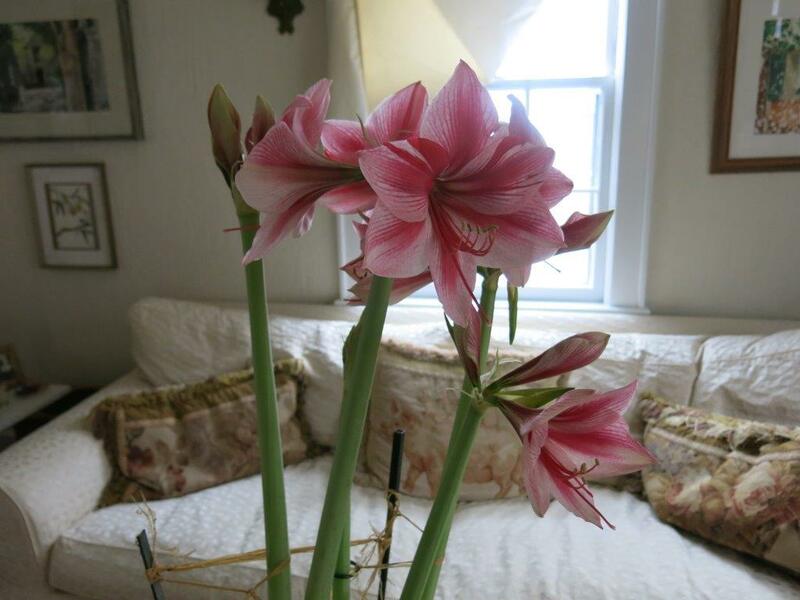 To notice the details, appreciate the beauty, get to know intimately the plants we nurture. How else could we learn to value what we have? The same could be said of how we miss out on time with our children and other loved ones. We are so focused on doing what we think they need, that we fail to spend time with them doing nothing in particular. It is in that last ‘activity’ that we are given the opportunity to truly acquaint ourselves with our own. How often we have surprised ourselves by having a proper conversation when ‘trapped’ in a car! Or when sitting down all together for a meal where no electronic devices are permitted. Young children are good at doing nothing and still observe and learn about their surroundings. While it might appear that they are unoccupied, they are in truth filling up on information about their world. They are living life. We could do well by giving ourselves such a break in our over-scheduled days. 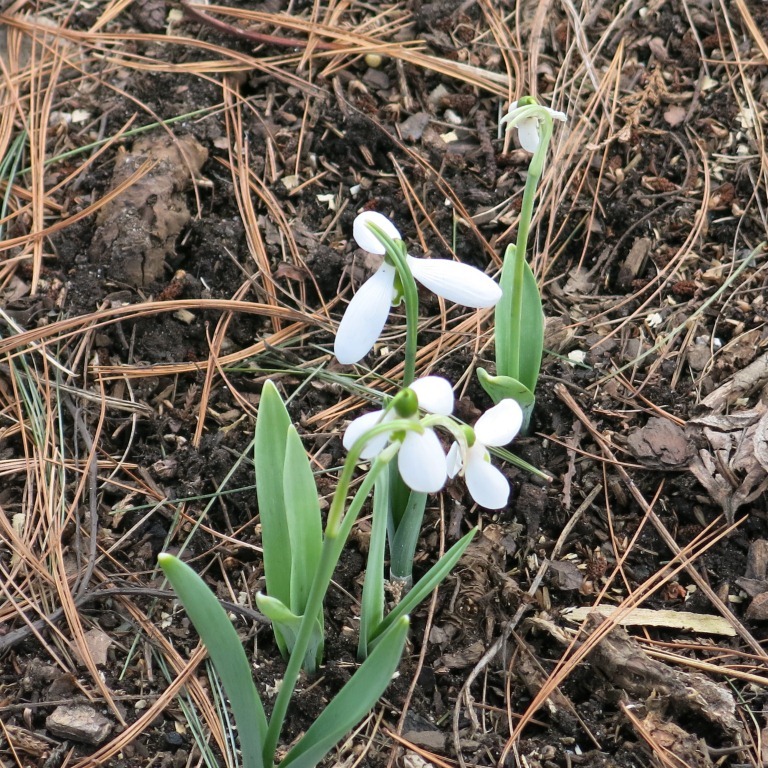 Because there was so much confusion about how much snow we might get, I was afraid all might be lost with the early bulbs. So I decided to go out and take photos of whatever was in bloom. Once I started photographing, I realized how much I neglect to notice at this time of year. 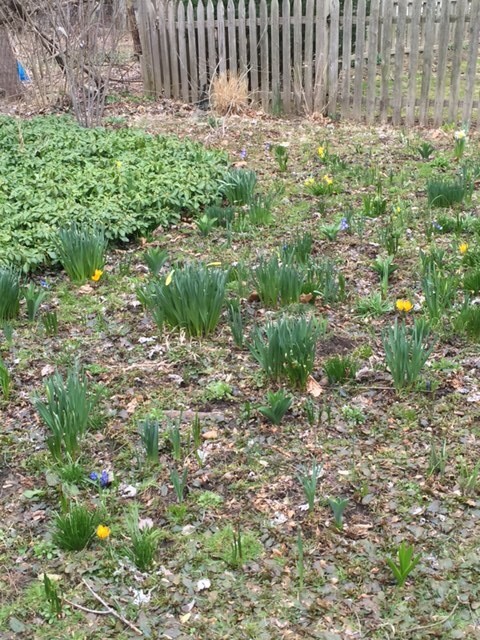 The yellow crocuses bloom before the others. 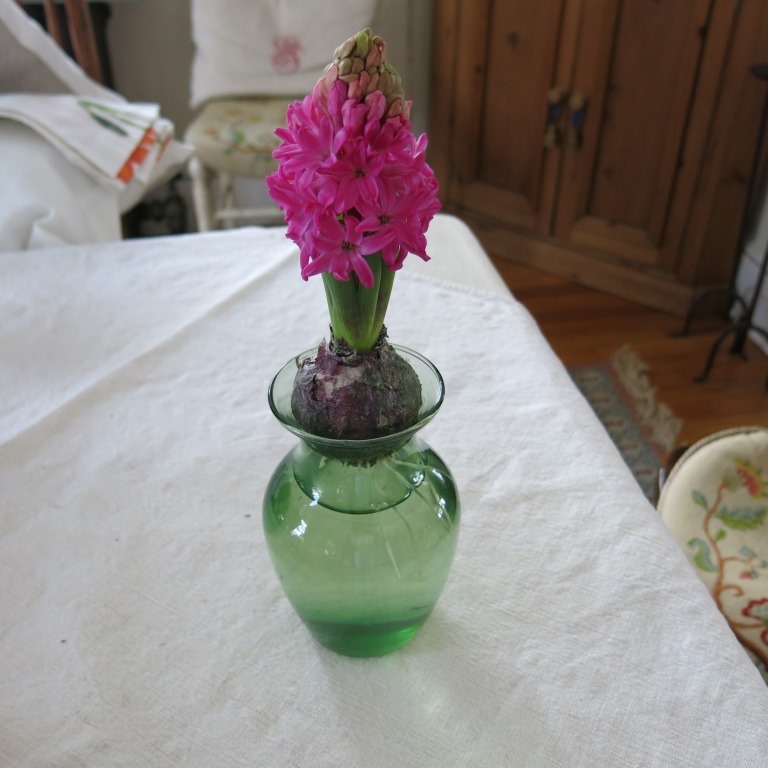 The wood hyacinths start two weeks after the crocuses – I’m usually so occupied with my spring chores that I notice these timid bulbs only when they are in full form. Yet, their slow progress is in itself a gentle reminder to savor every moment. 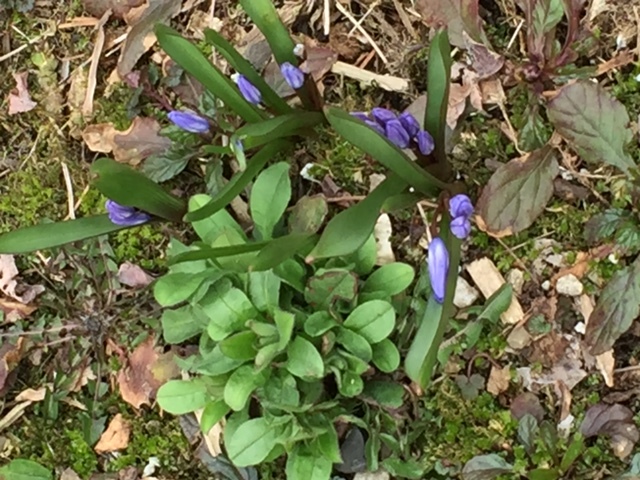 The muscari are close to follow and their tight buds resemble diminutive, deep mauve wands. 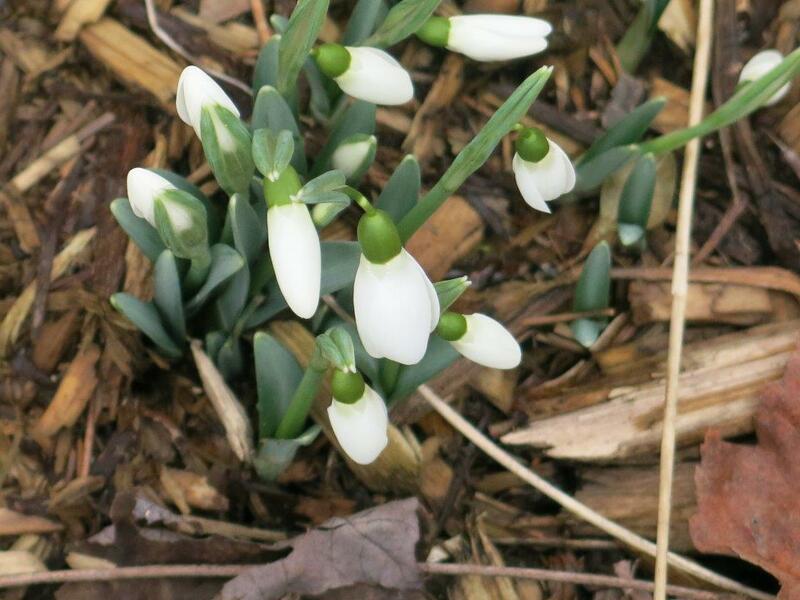 Soon they will reveal their lighter hued tiny bells. At this time, the roses are putting out new leaves – shiny and bronze. 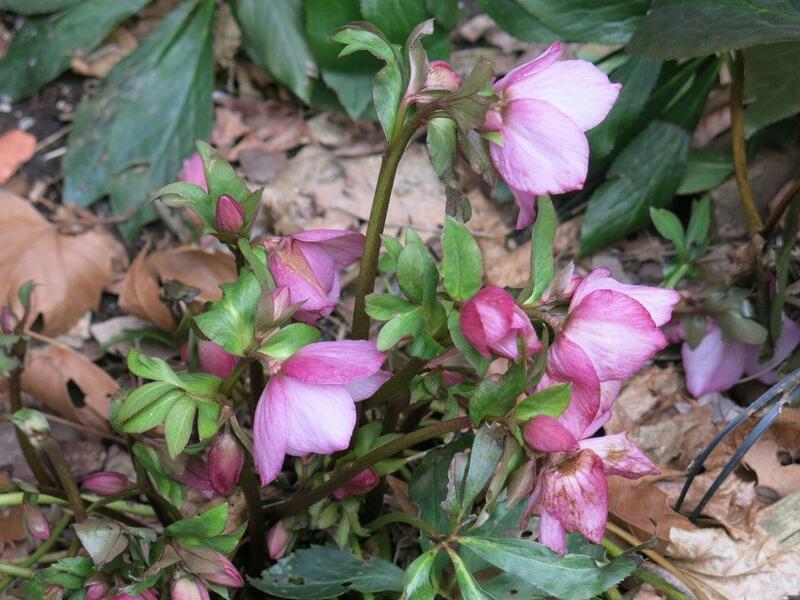 The hellebores have peaked and some are even bold enough to tilt their faces upwards. 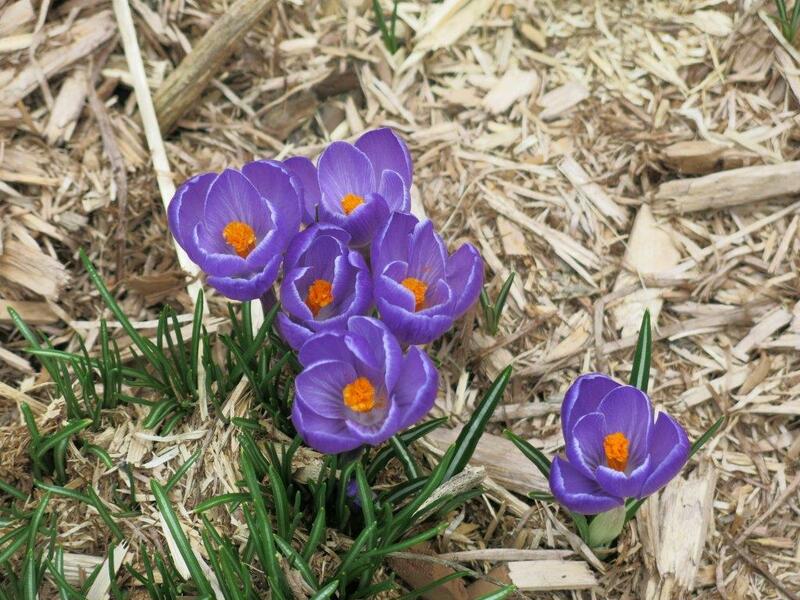 Their pastel colored flowers contrast strikingly with the rich jewel tones of the crocus. The pale yellow petals of the early daffodils glow softly in the sunlight. And I wonder how I might capture that luminescence in watercolor. So ethereal. All the while, all manner of birds are making sorties to determine where they might set up their nests. 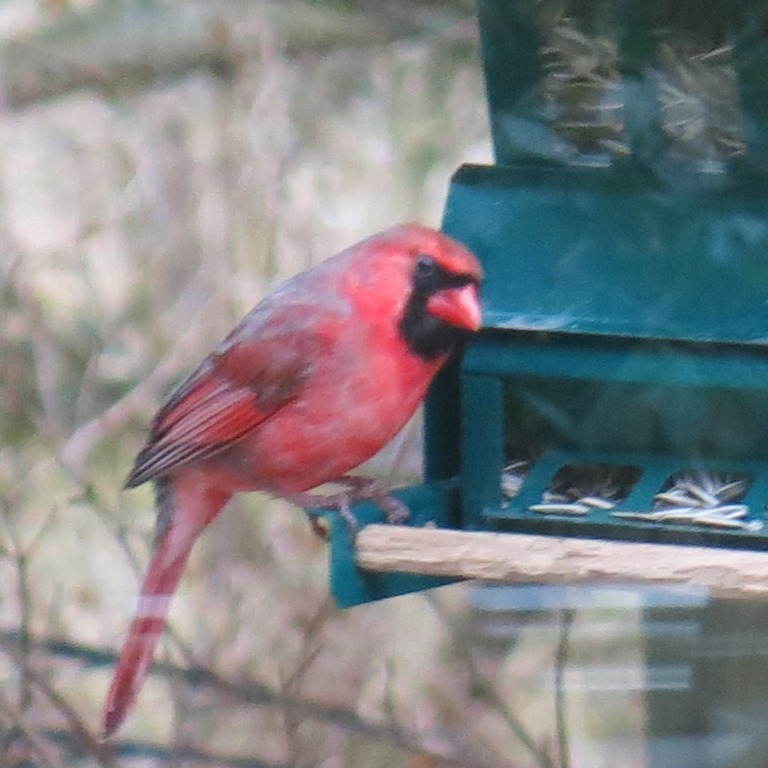 I watch a pair of cardinals foraging in the meadow as though ensuring the food supply they will need once they have babies to feed. 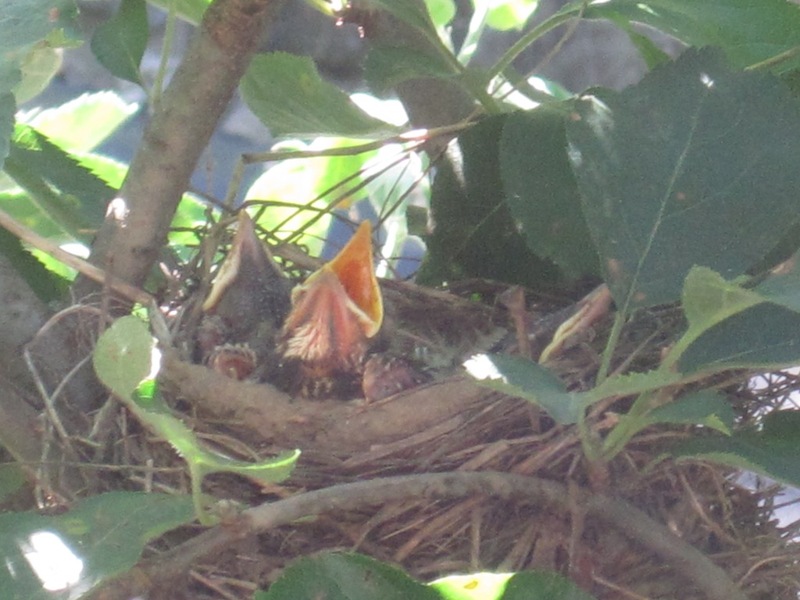 Their nest is clearly going to be amidst the brambly limbs of the Paul’s Himalayan rose that covers the very old apple tree in the meadow. This is a favorite amongst other birds as well. It seems the blue jays have elected higher quarters. 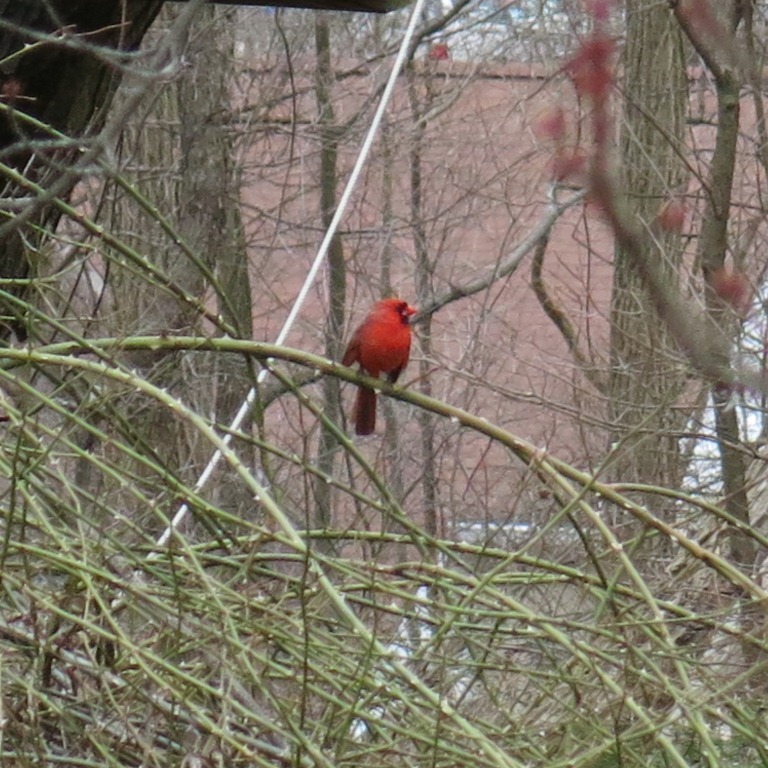 I see them perched on the sugar maple. Finally, I come back indoors to attend to other matters. The clock says I was away for a whole hour and that comes as a real surprise. I’d been so immersed in the goings on of the garden, that I’d shed all other thoughts from my mind. No wonder I felt so relaxed and high in spirit. I had taken a wonderful, life affirming break. As I write this post, news of the terror attack in Belgium is flooding the airwaves. Another reminder that life is ephemeral. Here today, gone tomorrow. So this week, I’m taking an honest spring break. I’m going to enjoy this season of rebirth and renewal. The chores, and there are so many, will wait. I want to remember my todays. Correction! 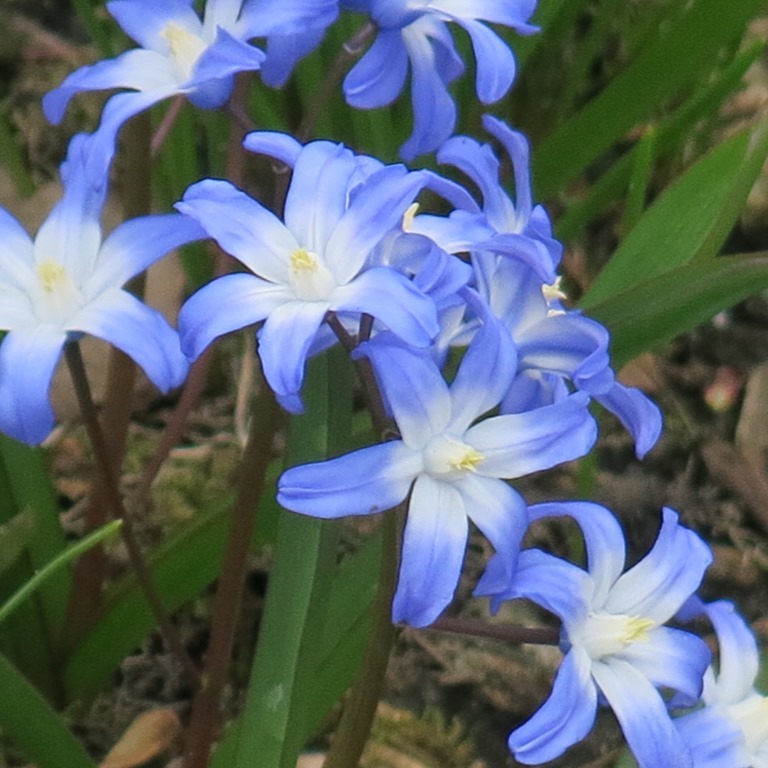 My garden’s Open Day is now May 7. 10:00 am to 4:00 pm. This week, I have art work on exhibit at the Phyllis Merriman Gallery in NYC. Do take a look if you can! I have posted my most recent visit with the HIV children of Mukta Jeevan. I know you will be interested in reading on their progress. Click Girls Just Want To Have Fun! I’m getting ready for an onslaught of guests. They will be in residence for some months. Yes, months. And I’m super excited. I intend to get their quarters in tip-top shape. My aim is to make them so comfortable that they feel completely at home here. There is a Jewish proverb that says Hospitality Is One Form of Worship. Well then, I’m worshiping mighty zealously. Cleaning, washing, removing clutter, freshening, ensuring that every detail has been included. I can’t do enough. That’s how eager I am. As always, some guests have arrived ahead of time. Rather than get distressed, I’m using their presence to spur me on to work fast and create the best accommodations for my treasured company. It is going to be a joyous, no holds barred party. You are now thinking I’ve taken leave of my senses. Who would want to entertain guests beyond a a couple of days? Yet, here I am preparing to welcome a plethora of visitors and then permitting them to stay for as long as possible. No, no! I’m quite sane. I’m getting the garden ready for season! All the plants are my personal, most cherished guests. In Turkey, there is a saying that guests bring good luck with them. I fully expect to enjoy that benefit in abundance! Preparing the garden for the growing season is quite like getting the house ready for guests. There is the same excitement, anticipation and yes, even apprehension. There is the desire to provide a warm welcome, comfort, clean and adequate space, good food and drink, interesting company and a strengthening of bonds. One goes about it in a flurry of activity. The plants arrive like old friends – familiar and comforting. We are ready to enjoy each other. Every season also brings new arrivals and so the circle of friends expands. Having been overseas this past week, I’ve returned home to find that spring has definitely arrived. A bit ahead of schedule but nevertheless a welcome sight. 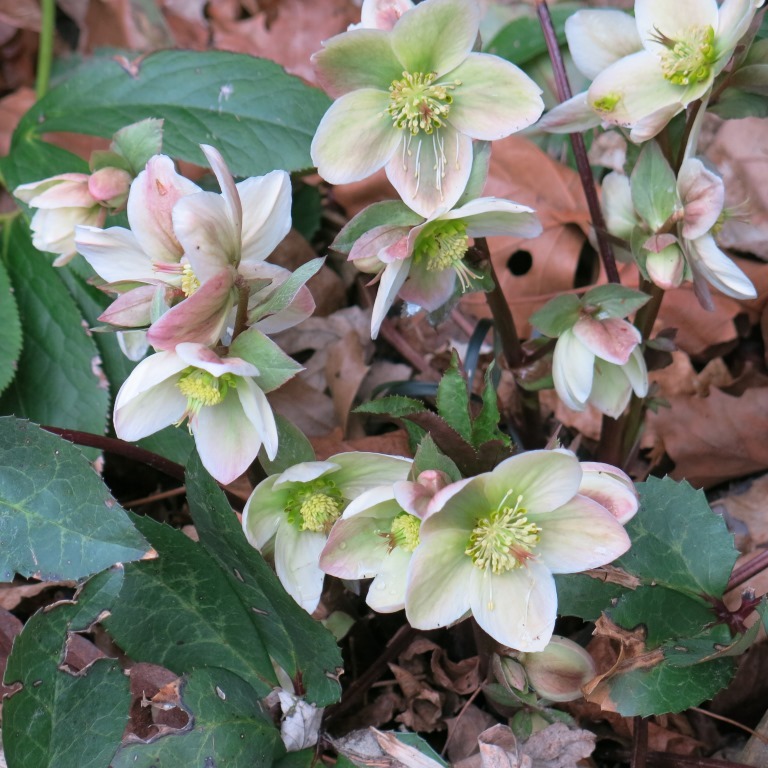 The hellebores that had started blooming some weeks ago are now joined by the snowdrops, scillas and crocuses. The sugar maple is heavy with red flowers. They contrast strikingly with the white flowers on the Abeliophyllum distichum near by. This has galvanized me into action. There is no time to waste. While I’d thought to get to my list of pre-spring chores in a few days after jet lag had worn off, I am now already in full gardening mode. Within hours of getting home and unpacking, the front lawn was addressed. With rain expected, it seemed an ideal time to do the reseeding. Done. Whew. Pruning, cutting back, clearing deadwood, feeding the beds with compost, mulching, planting and sowing will commence as soon as possible. Urns and window-boxes will get potted up. Bird houses to clean and water-baths and fountain to restart are next. In creating a most wonderful, life affirming environment for the plants, I’m hoping to keep the plants utterly, giddily happy that they thrive and look spectacular. And that would make me reciprocally happy. To be in service of my garden is indeed my own form of prayer and meditation. After all, to tend to the earth with thought, compassion, love and care is to connect to a higher power that provides and nurtures my very existence. Note: While on the subject of visitors, the date for my garden’s Open Day has just been set. From 10:00 am to 4:00 pm on Saturday May 07, 2016. Please come, I look forward to welcoming you! Mark your calender. Nesting Instincts. Enlightened Gardening #3. Nothing like the sight of babies of any species to turn us into mush. It simply cannot be helped. I never tire of seeing the homes the assorted garden creatures make. Bird nests are of course the most obvious. But solid looking adobe-like bee hives, papery nests of wasps, the large, messily put together squirrel abodes, the perfectly spherical beads of butterfly eggs on leaves of select plant, the cottony casings through which are visible the growing baby spiders are all the result of parents no less dedicated or anxious than we humans. In the role of parent, across genus and species, we can understand each other with total clarity and empathy. Is that not marvelous in itself? 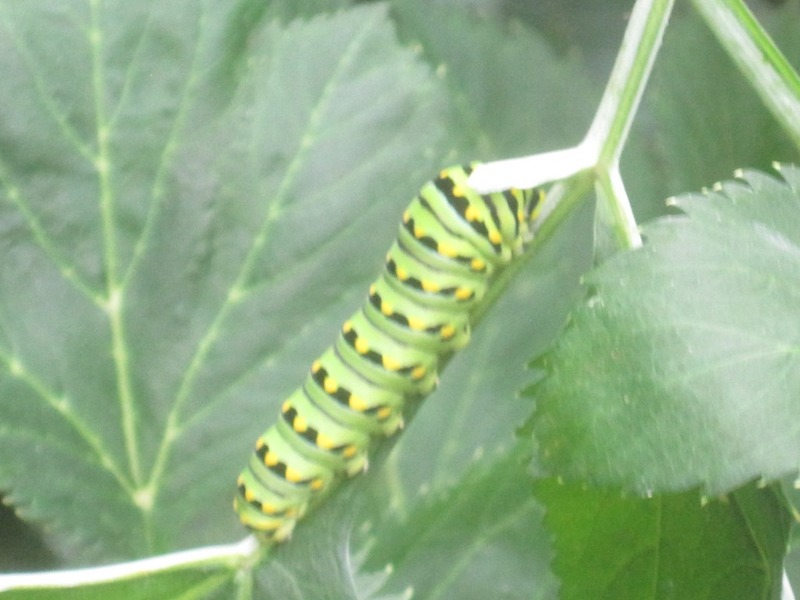 A healthy garden will support all sorts of beneficial creatures. Any gardener worth her salt will do everything in her power to do right by her garden. Which brings us to part 3 of our goal to creating gardens with a conscience. Enlightened Gardening. Given all that we now know about the delicate balance in Nature, our role in impacting the environment and, how each living thing is connected to every other, it becomes imperative and urgent to do our part and do it well. 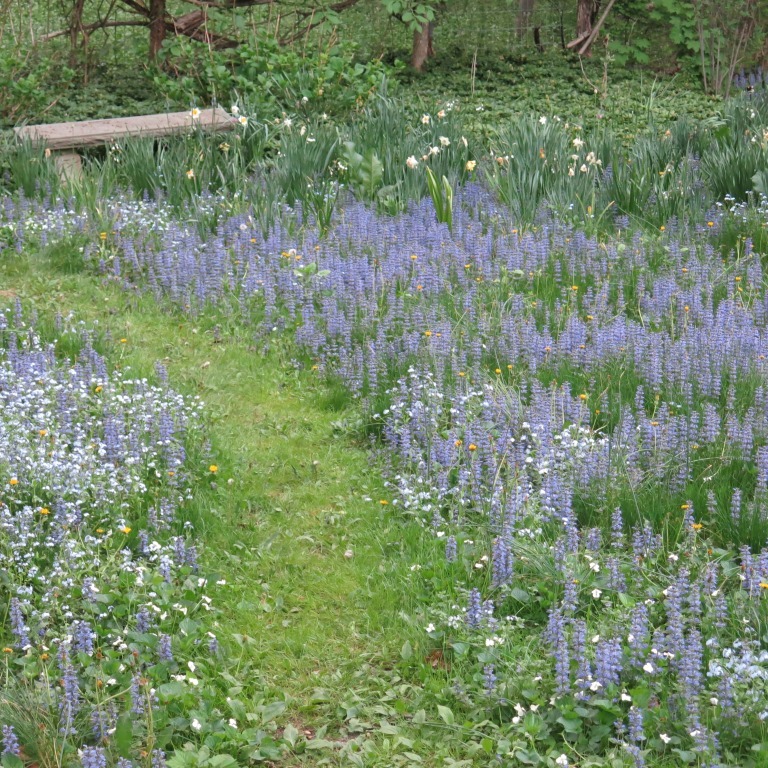 Imagine entering a garden that is lush with flowers, neatly clipped hedges. Even some clever topiary. Mature trees. Green lawns. Exquisite statuary. Sounds lovely so far? But now notice the quiet. No hum or buzz or shriek or trill or hurried rustle. Dead silence. Begins to feel strange? Then notice the absence of all animal life. No sign of movement but for a passing wind. Nothing flitting, flying, scurrying or hopping. I can already sense my panic. Like a child in an Halloween haunted house. Something bad is about to happen! And that is what animals bring to our gardens, our world. Not only do they perform basic necessaries like pollination and pest control but they bring in the full spectrum of life itself. We could not function without them. Our spirit would be lost. So, starting with including indigenous plants, a garden must offer a safe haven for beneficial creatures. Thickets and brambly shrubs for certain types of bird nests and other insects to find shelter and avoid discovery by their predators, Trees for other birds and squirrels. Discrete piles of fallen branches and upturned pots to give safe harbor to toads and garden snakes. Bird houses, nesting boxes, bat houses, bundles of narrow, hollow cylinders of wood or bamboo to encourage bees to take up residence. Just like humans, other creatures also look for the ‘right’ neighborhoods. 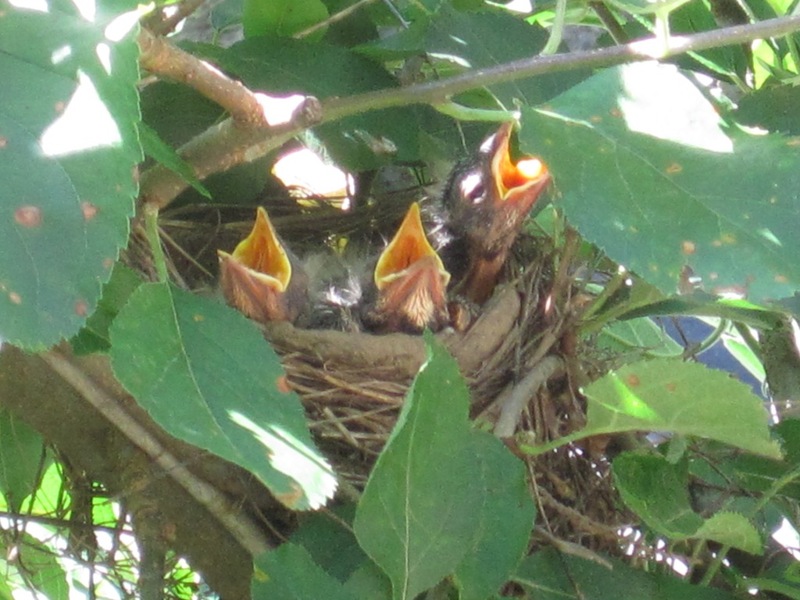 If you’ve ever watched birds check out possible nest building sites or houses already in place, you’ll know how carefully they consider the options. Safety, privacy, availability and access to food, light and wind exposure are factors uppermost on every animals mind. Sound familiar?! It is in the interest of all concerned parties that the gardener does her bit to create the appropriate environments for the valued creatures. If we want them to grace us with their presence, then we must do the needful. Apart from a choice of housing locations, there must be available water and food. A water-bath, a fountain or a pond will suffice. Appropriate and diverse plants for food. Birds are good at scouting out where to get bugs and worms as well. If the garden is organic, then the food and water will be naturally clean. For us and for our fellow residents. 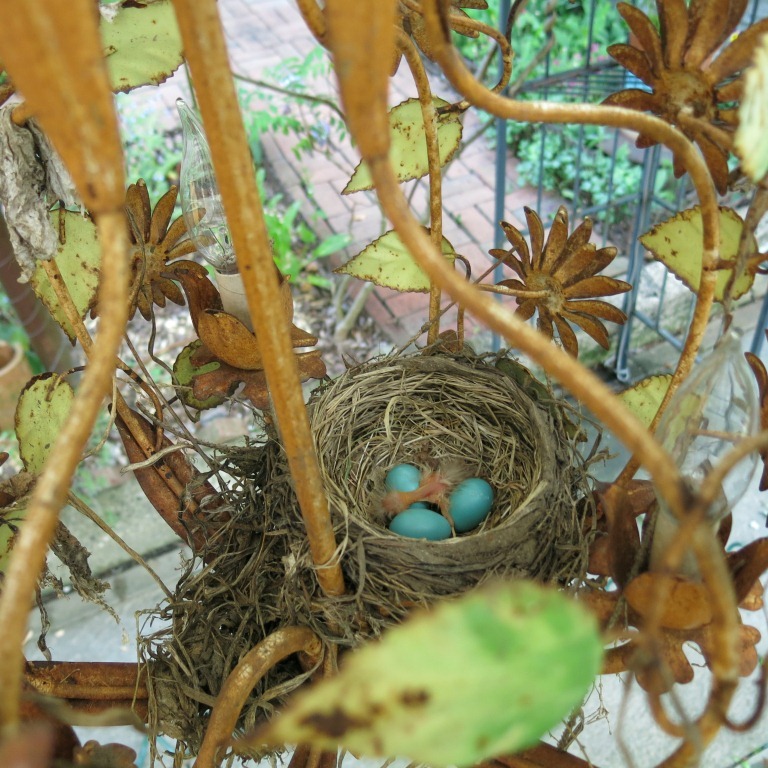 In very early spring, I put up a ‘nesting wreath’. A bunch of grapevine clippings are woven into a circle. To this I loosely attach natural fibres like cotton, jute or wool, feathers, twigs, hair, ribbons of colorful paper, dried flowers and leaves, moss and such. A little reservoir of nest building supplies to encourage the avians. We provide a healthy place for them to live and raise their babies and they return the favor. No doubt we also provide each other a certain amount of entertainment in the bargain. Isn’t this how life is best lived? This bluebird house is not in the ideal location but I’m optimistic. It hosted wrens last year. Maybe this year I’ll try to move it to a more appropriate site. At the same time, it is a safe haven for some creatures. I’ll say it right off – keeping an organic garden is not so easy. I’m not saying it is difficult but it does require greater vigilance and prompt, timely measures. Compared to freely applying chemicals preventively and pro-actively, organic practices are somewhat more demanding. But isn’t that worth it if it means not polluting the air, soil or water? Are our children and pets not worth that effort? They should be able to play freely in the outdoors without worry of getting sick from chemicals in their environment. Preserving the health of our world is the legacy we pass on to future generations. Last week I regaled you with the power of compost on your lawn. In truth, it is essential everywhere in the garden. I know it is hard to believe that this one ‘product’ can be fertilizer, mulch and thereby weed suppressor and water-conserver all in one. But that is only because the manufacturers of chemical/synthetic fertilizers and pesticides have done an excellent job of telling us otherwise. This is no different from baby food manufacturers who in the mid-1900’s convinced women that the factory made formulae were superior to breast milk. But we now know better don’t we? Enough said. I use compost on lawn, flower beds, pots, vegetable plots, around fruit trees and shrubs. Literally everywhere in the garden. In the beds, I do cover the compost with a layer of cedar wood chips for both aesthetic reasons as well as to create a hindrance to the vagaries of digging critters like squirrels, dogs and cats. No other product needed. On the few occasions when additional feeding and spraying is required as in the case of nurturing the apple and pear tree espalier fence, only organic products like seaweed and fish emulsion and dormant oil spray are used. Producing organic fruit is a particular challenge and I’ve learned to deeply respect the farmers who supply our markets. In conjunction with maintaining an organic garden, it is imperative that the plants one selects are largely native plants. Native flora attract native fauna. These native fauna will not only pollinate cheerfully but they will also safeguard the plants from predators. 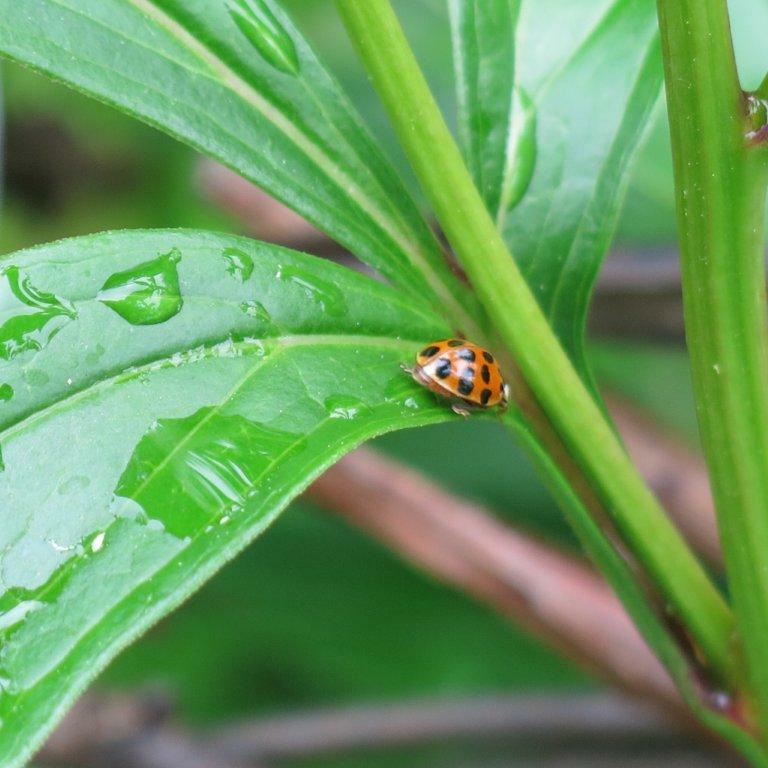 Think ladybugs eating aphids, birds picking off pesky beetles and caterpillars, bats devouring mosquitoes etc., Research has shown that when a plant is attacked by pests, it does two things. First, it changes its leaves by making them less nutritious and then, it releases chemicals like jasmonic acid that act like ‘screams for help’ which are signals picked up by beneficial insects that zoom in to feed on the pests thus protecting the host plants. 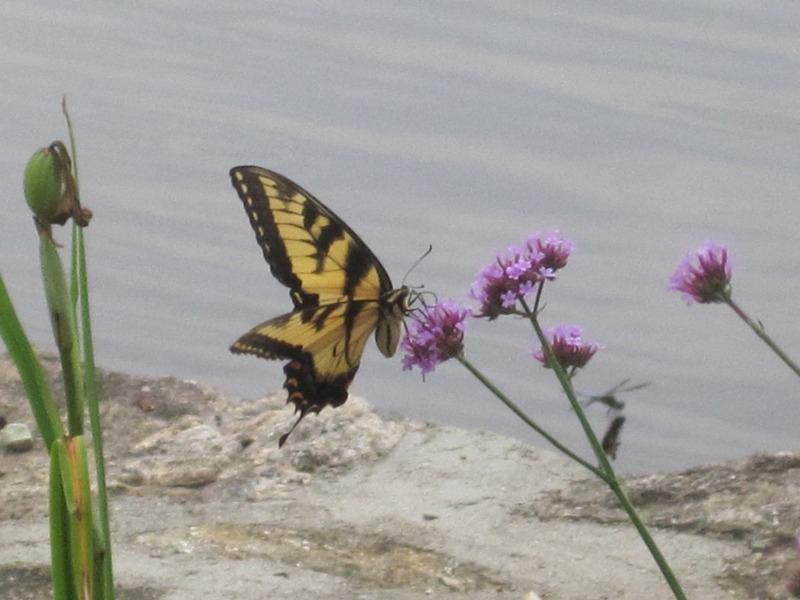 Even more interestingly, planting the right plants alone does not bring in the right insects. The pests must arrive first, do some harm to which the plants ‘cry out in alarm’, and only then will the predators show up. There is an implicit protocol or line of action that ensues. While we are still trying to understand these highly complex and rather impressive phenomena, we can purposefully create the correct balance of flora and fauna thereby doing right by the environment. Whether one uses chemical or organic pesticides, we are not simply taking care of specific pests. The products are broad-based killers. So even the good guys are wiped out. It is important that we do not use any product if we can help it. For example, dormant oil spray is applied to smother the eggs of pests such as aphids, certain mites and scales. But it will also cover everything else. So, when it is sprayed is crucial. 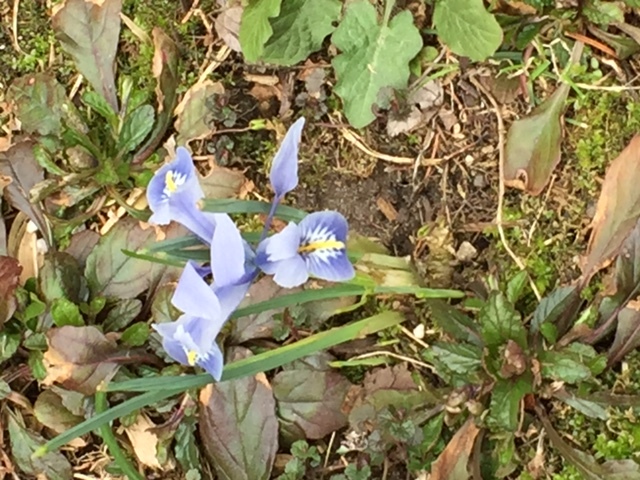 The window is small – when temperatures are above freezing for more than 24 hours but not yet too warm,when rain is not expected for a few days and, before leaves are put out and the buds have not as yet opened. Miss that time and then don’t bother. It’s too late! Or else you risk choking the leaves so they are unable to photosynthesize properly and, coating opening buds making them unpalatable to arriving pollinators. My general principle is to keep it simple. As few or no products. Accept that organic fruit may not look perfect. They will however taste wonderful. The sheer, unadulterated joy of biting into an apple right off the tree is priceless. Or, how about a carrot freshly pulled up from the earth and gently rinsed to get the grit off before crunching into its crisp, sweet, orange flesh? Imagine having no worries when you pluck nasturtiums and roses to add color, taste and beauty to your salads and desserts. Scented geranium leaves to perfume lemonades. Chemical-free catnip for your cat. Are you catching the organic spirit? 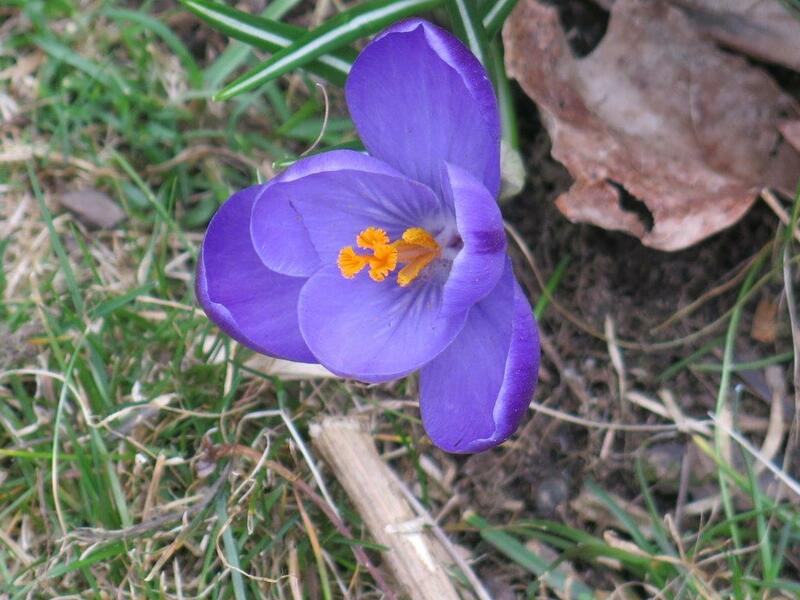 So first, get yourself started with a collection of native plants. ( see my article from 2 weeks ago Giving Back To The Future for sources) and organically produced vegetable seeds and/or plants which are available at any good nursery. 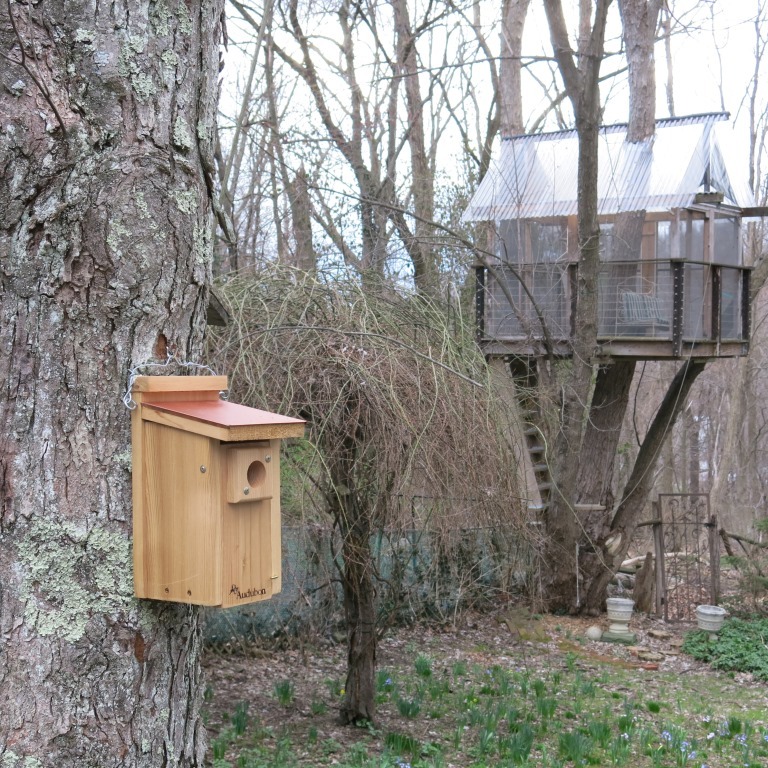 Set up bird baths, nesting boxes and hidey-holes for beneficial fauna to take up residence. Set up your own composter and feed it garden and kitchen waste. Until you start generating your own compost, purchase it from local nurseries. Your town, like mine, might have a place to get free compost. ( For a nominal fee, they will even deliver large amounts of compost or wood-chip mulch). 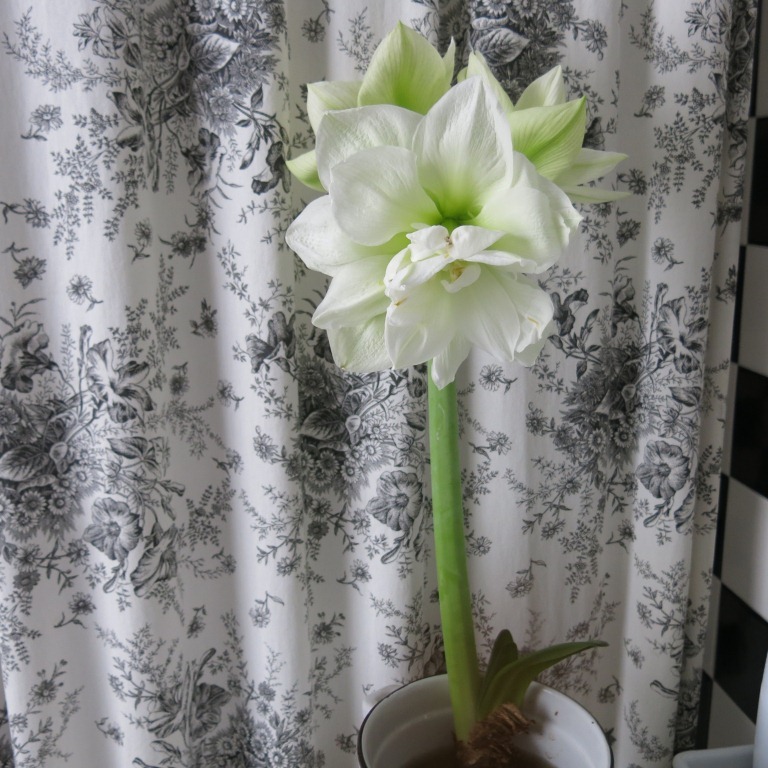 Get to know your plants intimately. Learn their appearance and habits. This will prepare you to notice right away if something is amiss. Act promptly and prevent further damage. Now you are in the organic business. Get to work!